The vehicle computer Zebra VC70N0 is the terminal which gives you a complete overview - at any location. Equipped with a 10.4 touch display 26.4 cm it is the perfect size for mounting in forklifts, lift trucks or in trucks - enjoy complete real-time communication via Wi-Fi and Bluetooth. 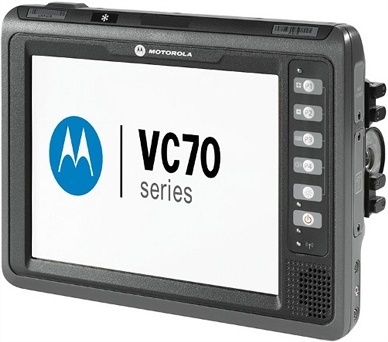 Utilize the VC70N0 at airports, in warehouses or in transportation, because its robustness comes standard thanks to its aluminum cast construction, IP66 class protection against dust and water, plus shock resistance according to MIL-STD-810G, you are ensured that the VC70N0 will last a long time. Mounting with either the U-mount or standard VESA mount gives you the necessary daily flexibility. Its Dual Core processor with 1 GHz, 512 MB RAM and 2 GB Flash expandable to 32 GB delivers enough power for graphics applications and its 600 Nits display is easily readable. When the temperature drops the automatic display heating activates thereby the VC70N0 covers the temperature range between -30 to 50C. Optional corresponding peripherals are also available.